I know this will probably make me sound like a boring fuddy-duddy, but one of my absolute favorite places is my own backyard. We only own an acre of land, and our backyard, fenced in for Liam, is probably about one-half acre. But our property, modest though it is, abuts a watershed for the Upper and Lower Narrows Pond, the primary source for Winthrop’s drinking water. So behind our house is a big woods, full of life and mystery. It’s not ours, but it gives us an expanded feeling, especially as no development is allowed on this land. From December through March, our backyard is snowed-in, and except for the shoveled paths, it is not accessible to us. (To our great delight, the birds and squirrels, however, still come and go. ) But as soon as the snow melts, the yard is open to Clif and me, and I never get tired of looking around to see what’s going on. Spring, summer, or fall, there is always something to notice. The goldfinches, who are making a sound and a fury most days, are flocking to the feeder, and the males are slowly beginning to show their beautiful summer plumage. 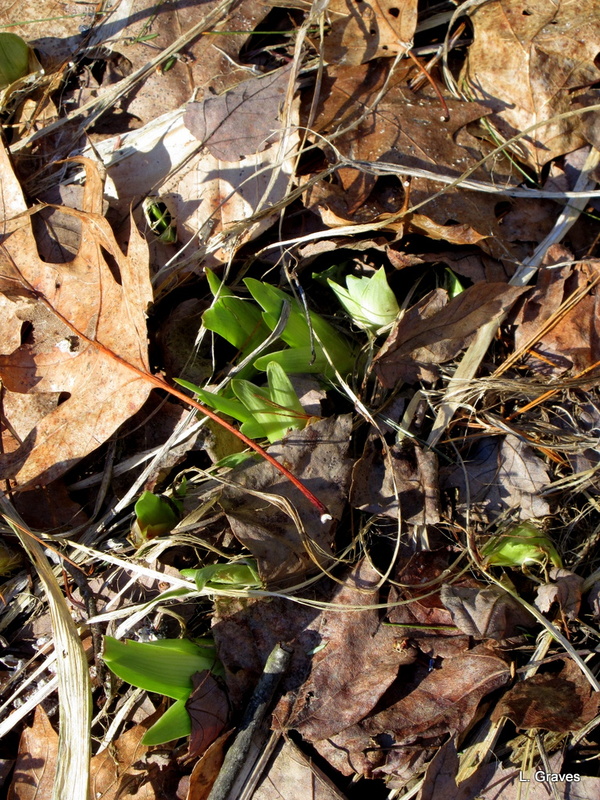 And speaking of slowly…the irises are starting to poke through the layer of leaves in the garden. Perhaps next week, I’ll clear those leaves and see what else might be coming up. When I’m in the backyard, I always like to look into the woods. Right now, I can actually see a little ways in, to the stone walls that once bordered this land when it was all fields and no woods. 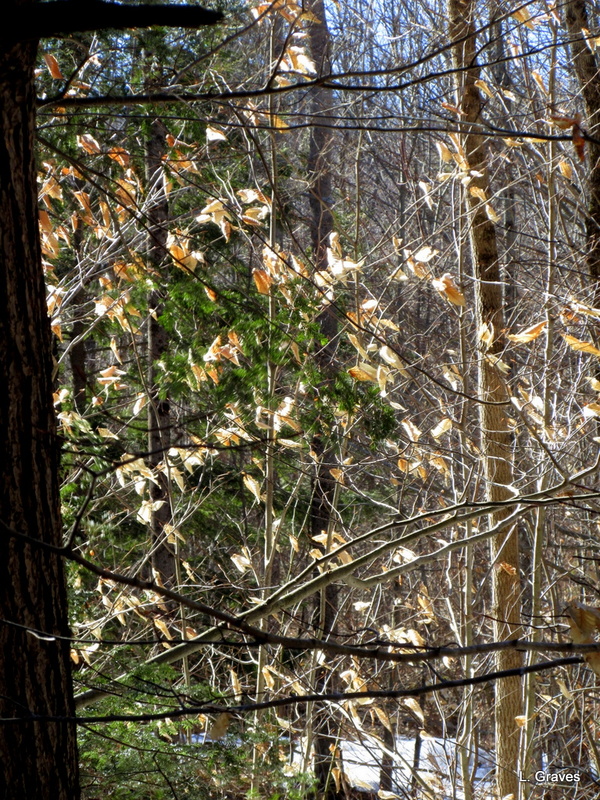 Most of the trees have yet to bud, much less leaf, so last year’s beech leaves still provide a subtle yet shimmering beauty. 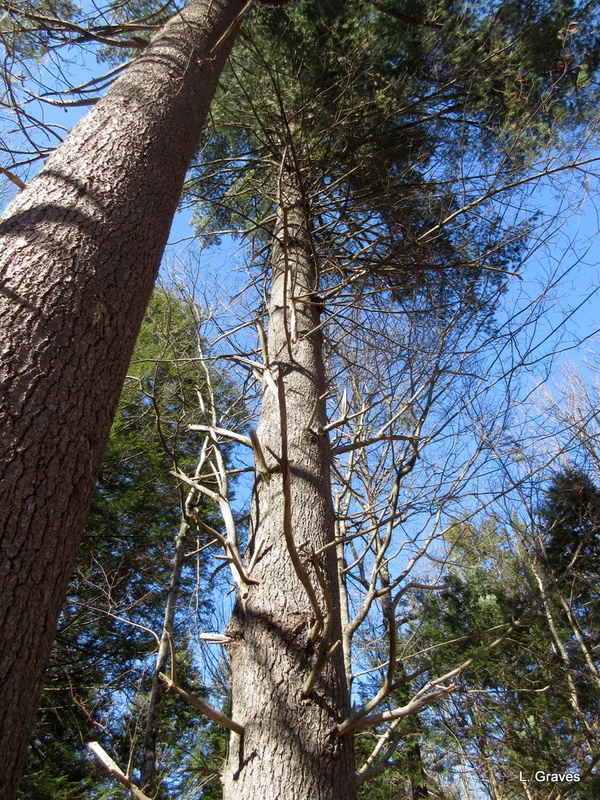 Finally, I like to look up at the huge pines that border our yard. After a long winter of mostly looking out the bathroom window—my blind—it is such a pleasure to be out poking around my backyard, watching as spring gradually shows her pretty face. I just cleaned out my flower bed in front of the house. Removed tons of pine cones and small branches. And here comes more snow. Winter just won’t let go. Sure is, but winter is not quite done with us. Two inches and more to come. How lovely! You sound like a hibernating animal just pushing its snout out into the sunshine. I feel very happy for you! Yes, but here comes the snow again. Two inches and going strong. Oh No! Snuggle back down again! It sounds like a wonderful back yard, Laurie. We once lived on property that abutted a nature preserve with a stream and trails. It was delightful, as I am sure yours is. We feel so lucky. Our backyard and the woods give us so much pleasure. “only an acre” – that’s huge. In the UK most people simply can’t afford to own land and we are squished together. I do envy you your space! And what a beautiful space it is too. How lovely to have a wood so close. Thanks, Clare! Sometimes I feel a little foolish being such a homebody and loving my backyard so much. How wonderful your garden is your favorite place! And you have that wonderful pond, too. Yes, more snow. Enough so Clif had to shovel the steps this evening. Lovely – but now you have more snow. I was on a photography course run by Chris Weston some time ago. He said the best place for photography was your own back yard. Thanks, Derrick! Always so much to notice, no matter how small. 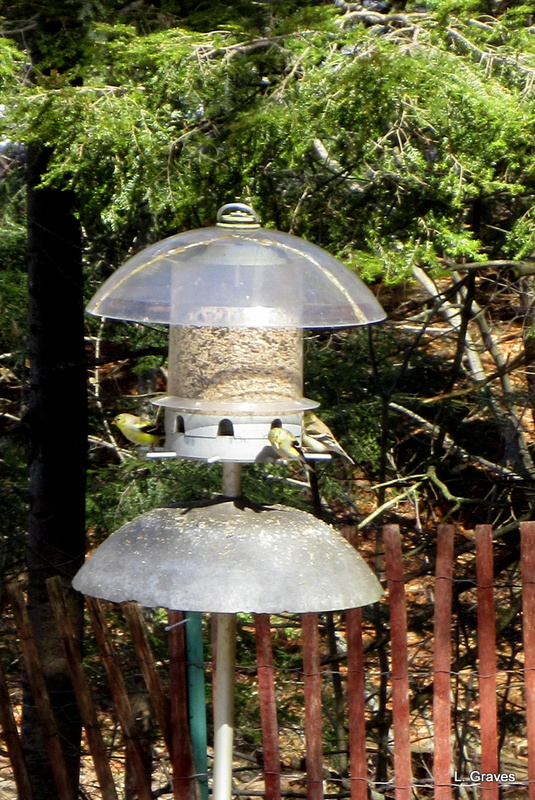 Goldfinches are one of my favorites. Mine, too! Love their twittering. I suspect that few of your readers would consider you a fuddy duddy for liking to be at home! We seem to be a like-minded group and have found each others blogs as a result! And to think, all that loveliness in your world is covered with snow now . . . again. Thanks, Kerry! And yes, more snow! What a trickster spring is. I too would rather be in my home backyard than any place in the world. Think of it not as fuddy duddiness, but rather a deep, heartfelt contentment. But your photos are sadly out of date! If your yard is anything like ours this morning, it’s covered in about six inches of snow and still coming down. Ouch. A beautiful way of putting it. How fast photos can go out of date, from one day to the next. 😉 We got a little over three inches of snow, and it’s already to melt. Belated April Fools? I keep telling myself it’s poor man’s fertilizer! Oh, wetlands! Away, away, snow! I loved the shot of the irises poking through the leaves and the wonderful tour of your backyard! I was out wandering through our yard today and the first crocus has emerged. New life is always such a joy to see. 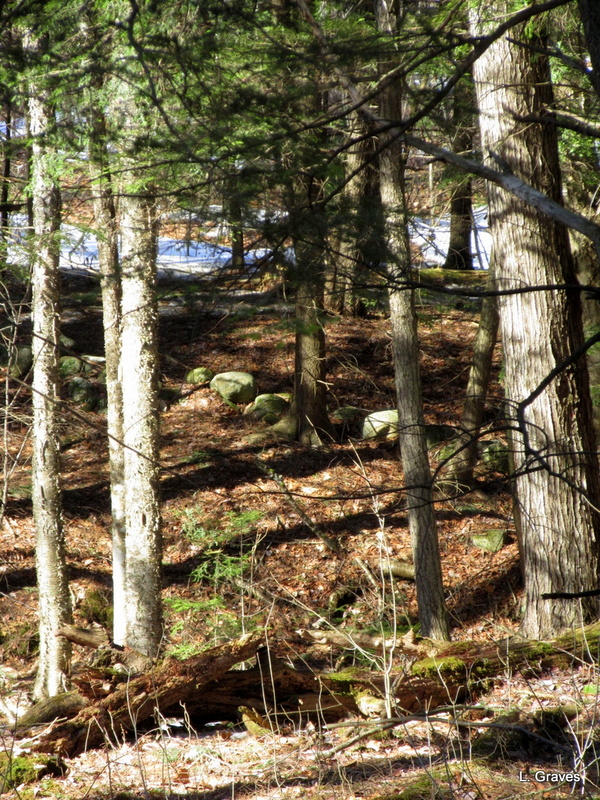 I love my backyard more than any other place too … And you are so lucky to have woods at the end of your garden. .. Wonderful! I can’t believe you have had more snow! Also, so lovely to read you love your backyard more than any other place. Warms my heart!